Bottom Line Up Front: This is a 50% out of 5 stars album. I have incredibly mixed feelings on this album. In fact, they are so mixed I’m going to completely contradict myself in this review. Is it a cop out to not take a firm stand? Probably. But life is rarely black and white. More often than not there are more than 14 shades of grey. Artist Background: Unfortunately, we are starting with the end of Rufio instead of the beginning. Why does that matter? Much like Our Lady Peace and countless other bands, losing one band member changed everything. In Rufio’s case, it was their founding member and bassist, Jon Berry. His bass playing had such a huge impact on the sound of the band. But what’s done is done. Rufio is a pop punk band founded in 2000 by four guys in Rancho Cucamonga, California. They’ve put out 4 albums then they broke up. Afterwards, one of the other founding members, Scott Sellers, did some work with the Dutch pop punk band, The Lost Boys Club. Highly appropriate given the origins of Rufio’s band name. Album Background: Anybody Out There is a pop punk album released in 2010 with a runtime of about 36 minutes. I find it has some serious emo/pop rock leanings myself. Wikipedia, however, lists it as strictly pop punk. The album was their first since they went on hiatus after releasing their original trilogy from 2001 to 2005. This is the first and only album to not include Berry. I actually bought this after wondering what happened to those Rufio dudes. I was kind of surprised to see they had released another album. I was even more surprised after I started it up. Why? Normally, I can easily identify their albums within moments of it starting as they all had a distinct Rufio-esque sound to them. But with this new album, that sound is completely gone along with ex-bassist, Jon Berry. I find it sort of funny I made a statement to a friend about 12 years ago that my main problem with Rufio was that they sounded so generic. Distinctly generic? That can’t be a thing. I told you this review was going to be filled with contradictions. Favorite Track: Nothing really stood out for me for this album in all honesty. But that’s a common theme for Rufio albums. It’s usually more about the listening experience of the album instead of any individual tracks. Consequently, I’m going to use my highly objective quantitative sing-along metric to bail me out of this situation. Essentially, it is which song did I catch myself singing aloud to the most times during the past week. And the winner is This I Swear. This song, in particular, feels more pop rock than pop punk, but at least it’s pretty catchy overall. Reminds me of Oleander’s I Walk Alone for some reason. Maybe it’s the introspective nature of both songs, which I tend to be a fan of. I don’t think they sound alike. It just reminds me of the Oleander song. Lyrics The lyrics writing approach is interesting. As far as I can tell, they take simple ideas and try to shift/manipulate them just enough so they aren’t so straight forward or cliche. Some artists can bring an extraordinary amount of beauty in simple lyrics but that’s also very difficult to pull off. I’m glad Rufio at least recognizes this and tries to give you something to ponder while you’re listening. Intros Rufio tends to be pretty damn good with riffs. Accordingly, I liked many of the intros on this album. I especially enjoyed the aggressive ones like those from Deep End and Little World. People often speak of the importance of the making a good first impression when you meet somebody new. You only have one chance, as the saying goes. I think it’s equally as important with songs. Give them something good and you’re already ahead of the game with the listener. Topics I blasted certain other bands for covering the same topic ad nauseam over the course of an album, so I commend Rufio for what they did on this album. I liken their approach to a painter doing a series of oil on canvas paintings where you have a consistent topic that you try to explore with different approaches. In this case, Rufio is exploring the topic of relationships. (I know! I am as surprised as you are! That’s hardly ever covered in the pop punk genre. </sarcasm>) They really do cover many different states of a relationship. This includes pursuing a relationship with a new person, not wanting to be in a relationship, being in the beginning of a relationship when there is all this optimism and positive energy, being in a bad relationship and wanting to keep going, being in a bad relationship and wanting to end it, being the one ending the relationship and having the other person ending the relationship, and so on. The breadth of it is pretty impressive for a single album. And even some of the way they covered common topics such as breaking up with someone is done well. There were numerous religious references found throughout the song Little World. The purpose was to evoke the notion that faith is often required to end a relationship when you don’t really know if it is the right thing to do. Lyrics While I like their approach of making simple lyrics more complex, they did it to the point where it became distracting. I spent an unusually high percentage of my time studying the lyrics of this album. As a result I don’t think I could appreciate the other aspects of the album as much as I would have liked. And it was incredibly frustrating when my attempts to come up with the meaning of a given verse proved futile because I’m certain it’s something simple. Maybe they should have went for a more weird approach so it would be more like an abstract thought exercise. Let’s bring it back to Our Lady Peace again for an example. Their song, Carnival, talks about yoga classes for cats in one verse. Hypothesizing why that line was included is fun even though I will never figure it out. Intros The intros are good for the most part, but as I was going through this I decided to start the song then quickly jump to the very end of the song. What I discovered was that the ending is basically the intro but they let the last note slowly fade out. They actually did this for the first five songs. That came off as lazy writing to me. And five straight songs is a pretty big deal on a twelve track album. Topics Is there a problem with covering so many aspects of relationships on a single album? I would argue it can also be a bad approach. It can come off as a scatter shot method in which an artist is attempting to try to reach as many people as possible in hopes to selling to a wider audience, thus making more money. Starting a new relationship? We got you covered. Breaking up with somebody? We got you covered. Somebody break up with you? We got you covered. Just trying to concentrate on yourself? We got you covered for that too. It’s like being the Walmart of relationship songs. In Conclusion: This album is very much a mixed bag. And not just in the simplistic sense of half the songs are good and the other half are bad. 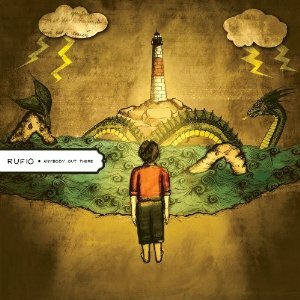 Instead, the underlying qualities of the songs are individually mixed with no real bulletproof conclusion of “Is this album is good or bad?” If you’re still interested in Rufio after reading this, I would encourage you to start out with their first three albums. You will be a lot happier with those. The guys involved provided a very solid effort here as I wouldn’t question the musical abilities of any of them, but it just didn’t quite click for me. On a final note, like some other bands I covered, even though the band is no longer together, they are doing one last show together. For Rufio it will be on June 18th, 2015 at the Montebello Rockfest. I took a look at the lineup for the Canadian rock festival and it’s deee-cent. If you’re looking for an excuse to go to Canada this summer, Rockfest is a pretty good one. I couldn’t find any official music videos unfortunately.